Ernest Upton Corbin, ninth and last child of James & Margaret, was born on 4 January 1885 when the family was living in Glebe Rd. This would have been a busy time for the family, with now eight children in Margaret's household and James preparing for construction of his big arcade project. Ernest was baptised at St James Forest Lodge. The sponsors were from the Clancy family, showing that the link from Margaret to her original family remained strong. Very little is known about Ernest's life, and what we do know has been supplied recently from Lillian's family rather than Ernest's. 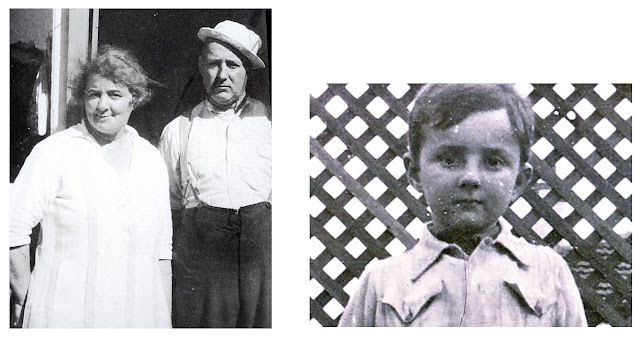 The two small families of Ernest and Lillian had been friendly in early years, and some memories and photos had survived, including the image of Ernest on this page which is the only one known to exist and had never been seen by Ernest's own descendants. One minor record that has survived is an account for his school fees when he was a 13 year old - he attended St Aloysius College, then in Bourke St Sydney. 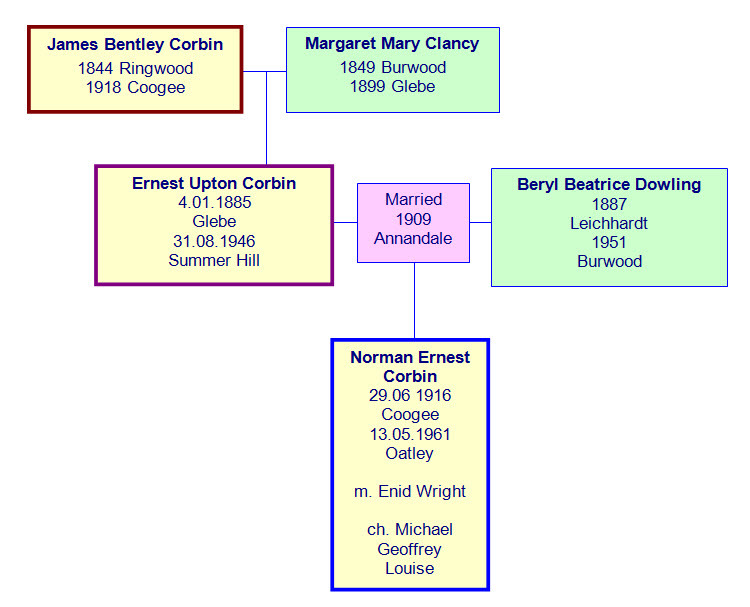 In 1909 Ernest married Beryl Dowling. They had one child, Norman. At first they lived at 233 Annandale St, Annandale then after five years they began moving more regularly but always within the suburbs of Sydney's Inner West. Nothing is known of Ernest's occupation except that his death certificate reads 'retired clerk'. Ernest died at age 61 on 31 August 1946. He was buried at Rookwood by Father Eric Corbin. Beryl died in 1951. Ernest's only son Norman was an accomplished employee of the Westinghouse engineering company. He died in 1961, and has 2 sons living. It is remarkable that within this family, where little is known about Ernest, the oldest memento of James Bentley Corbin himself is being looked after - the athletics medal James won way back in 1865. We are grateful to this family for revealing it to the rest of us. Currently there are 21 living descendants of Ernest & Beryl.